Don’t be “SCARED away” by this list of S idioms. Many learners “SELL themselves short” and “SHY away” from idioms because they’re tricky. Don’t worry, these clear definitions and examples will help! My recommendation to students is that they just try to understand idioms and notice them at the beginning. It's possible to speak English at a very high level without using a lot of idioms yourself. 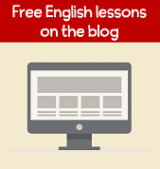 They can be tricky to use and it's possible to express the same meaning using other phrases. Although you don't need to use idioms in your own speech, you absolutely have to understand idioms when other people use them to reach an advanced English level. Native English speakers use idioms very frequently. Once you start to notice them, you will see them over and over again (often). 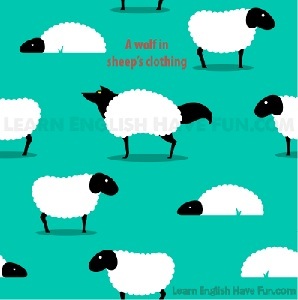 An idiom is a group of words that has a meaning that is different from the individual words that make up the expression. You'll notice this list has expressions beginning with the letter "S." The main word in the idiom starts with an "S". 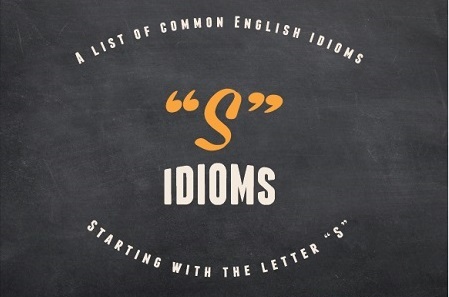 There are also pages of idiomatic expressions with other letters of the alphabet: click here to go to the main idioms page. hit the sack (hit the hay): go to bed. I hit the sack really early last night so I felt great this morning when I woke up. Turn off the TV now — it’s time to hit the hay. back in the saddle: doing something that you had stopped doing for a while. I started working out at the gym again and it feels great to be back in the saddle. Don’t worry, it’s just an ankle sprain—you’ll be back in the saddle playing tennis in a couple of weeks. in the saddle: in control of something. I prefer working on Saturdays when Sam is in the saddle because everything runs a lot more smoothly. Finally, a female is in the saddle at our company. saddle someone / something with something: to give someone or something a difficult task or responsibility. I cannot believe my boss just saddled me with another project. Our children are very immature so it’s time to saddle them with some chores to do around the house. After being saddled with student loan debt for the past 12 years, I finally got a second job and paid them off. safe and sound: not hurt or injured. My cat disappeared for two days and I was so worried but today she showed up safe and sound. Drive safely, and when you get home don’t forget to call us to let us know you’ve arrived safe and sound. better safe than sorry: it is more desirable to be careful then to risk a bad result. Insurance is expensive but when you’re traveling internationally it’s better to be safe than sorry. Here take this umbrella — I know you don’t want to carry it but better safe than sorry. in safe hands: in a situation where someone is taking good care of you. Don’t worry, you’ll be in safe hands with my assistant. I thought my mother would be in safe hands at the nursing home but no one’s making sure she’s taking her medication. play it safe: to not take risks in a situation. I think it was wise to play it safe and not try to drive in the snow. He played it safe and didn’t attempt his most difficult dive during the competition. (just) to be on the safe side: doing something to prevent an unwanted outcome. To be on the safe side, let’s leave an hour early so we don’t miss the start of the game. You might be hungry later — at least bring a sandwich or a banana just to be on the safe side. (there is / there's) safety in numbers: being in a group offers security and protection. In the wild, animals travel in packs and herds because there’s safety in numbers. I prefer to go to parties with a group of friends because there’s safety in numbers. easier said than done: talking about something is not as difficult as doing it. Eating healthy foods is unfortunately easier said than done. Sticking to a New Year’s resolution is easier said than done and most people quit soon after starting. something to be said for something: there are reasons why something is desirable or advantageous. There’s something to be said for being on time or a little early. There’s something to be said for having good manners at the table. when all is said and done: when everything has been considered. When all is said and done, you did your best and you can’t ask yourself more than that. When all is said and done, we couldn’t agree on the other’s religion so we finally broke up. sail through something: 1) to quickly and smoothly move through something; 2) to easily achieve something. We sailed through customs and immigration but then got stuck in traffic for three hours coming home from the airport. I sailed through college without any problems but had a really difficult time in law school. set sail: to start a trip by boat or ship. The cruise sets sail in Istanbul on June 2. I’d love to set sail on a romantic cruise one day. Unfortunately, the ferry never set sail because of bad weather. for old times’ sake: a way of doing something to remember something pleasant in the past. We’re going to wear our old football jerseys to the game for old times’ sake. Let’s play 80s music at the party for old times’ sake. for goodness’ sake / for Pete’s sake: an expression used in spoken English to emphasize 1) that someone is surprised or amazed by something; 2) that someone is annoyed, irritated or exasperated. [Note: this is a polite way to express this feeling but you will often hear people say “for God’s sake,” “for Christ’s sake’” or “for f*ck sake” in English—I don’t recommend using them because these expressions can be highly offensive]. For goodness sake! How did my dog manage to climb up on this counter to eat the cake? Just do your homework for goodness sake and stop giving me excuses. For goodness sake, why did you buy me another ugly tie? You’re 35 years old Eleanor—it’s time you stopped dressing like a teenager for goodness sake! For Pete’s sake, when is it going to stop raining? I said I will go to the store this afternoon; stop continually reminding me for Pete’s sake. rub salt in someone’s wounds: to make someone feel worse about a situation. My brother said I’m fat just to rub salt in my wounds when I didn’t make the cheer-leading squad. He made a huge mistake but don’t say anything more to him — you’ll only rub salt in his wounds. (the) same to you: (spoken) a polite way to wish the same good thing that someone has said to you. 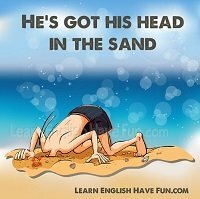 bury (have) one's head in the sand: to ignore or refuse to think about a problem or something unpleasant. When his wife left him for another man he buried his head in the sand and didn't remove his wedding band for three months. Dad I'm begging you to stop burying your head in the sand! That mole on your arm is growing and you need the doctor to have a look at it immediately! before you can say something: very quickly. The restaurant service was so good that before you could say “excuse me,” the waiters were already at the table to help. Before I could say “no thanks” the saleswoman sprayed me with perfume. have the final say: to have the authority to make a decision. I don’t have a problem with you going but your father will have the final say. Everyone agreed — except my boss — and naturally she had the final say, which was no. The beach was spectacular — needless to say the weather was sunny and warm. I’m broke so needless to say, I can’t join you on the trip. it goes without saying: obviously. It goes without saying that while we are away you should not have parties or invite a lot of friends over to the house. The baby is finally asleep so it goes without saying that you should be quiet. never say never: you should never say you’ll never do a particular thing ever again. I doubt I’ll ever go back to that restaurant but I’ll never say never. I hated my first golf lesson but never say never, I may try it one more time. say a lot about something: to show or give a lot of information about something. Her expensive jewelry and clothes say a lot about what she’d expect you to buy her for her birthday. Let’s go — this dirty silverware and wine glasses say a lot about this restaurant. sorry to say: I regret having to tell you this. Sorry to say this but we prefer it if you didn’t bring your dog into the store. I’m sorry to have to say this but we have to downsize our staff and your last day at the company will be today. to say the least: an expression used to show there’s more you could say about something but you’re not going to say it. Her outfit was skimpy, to say the least. The lecture was so boring, to say the least. (just) say the word: an expression used to tell someone to feel comfortable to ask if they need something from you. If you need any help with your homework just say the word. When you’re feeling overwhelmed just say the word and I’ll come over and babysit so you can get some rest. need I say more: it is not necessary to say more about something because it’s already obvious what would be said. It’s a 3 carat diamond ring, need I say more? I got a zero on the quiz — need I say more? say one’s piece: to say exactly what you want to say; to be able to express one’s opinion honestly. I asked the manager to meet with me for 15 minutes so I could say my piece. I really didn’t want to see her again but I knew it would never end until she had a chance to say her piece. scale back something (scale something back): to reduce or make the size, degree or amount of something smaller. We scaled back on our travel this year now that we have a baby. You’re going to need to scale back on the amount of salt you consume and increase vegetables in your diet. scale up something (scale something up): to increase or make the size, degree or amount of something larger. After we hired two more employees we were able to scale up the number of clients we could serve. The furniture store scaled up to a larger showroom so they could display more of its products. tip the scales: to make something more likely to happen. If I get a big bonus it’ll tip the scales for staying at the firm another year. I wanted to go to Stanford but the scholarship to the University of Michigan tipped the scales and I’m going there instead. tip the scales at something: to be a particular weight. I got serious about dieting after I tipped the scales at 165 pounds. Our luggage tipped the scales at 75 kg so we had to pay an extra $250! scare away someone/something (scare someone/something away): to cause someone or something to go away or stay away. You’ll scare him away if you continue to send him text messages all day. I got scared away when I saw how many people were at dance tryouts and decided to go home without even trying. scare someone/something away from something/doing something: to cause someone or something to not do something. When I saw open-heart surgery during my first year at college, it scared me away from a career in medicine. The long list of health and safety requirements usually scares people away from opening a restaurant. scare off someone (scare someone off): to cause someone or something to go away or stay away. Try to smile a little — that scowl on your face would scare off any prospective client. The aggressive salespeople at the store scared me off, so I went home and looked at the handbags on their website instead. scare the hell out of someone: to really frighten someone. When I saw my bank balance was negative it scared the hell out of me because my rent check hadn’t cleared yet. When my doctor told me there was a problem with my blood test it really scared the hell out of me but luckily it wasn’t anything serious. 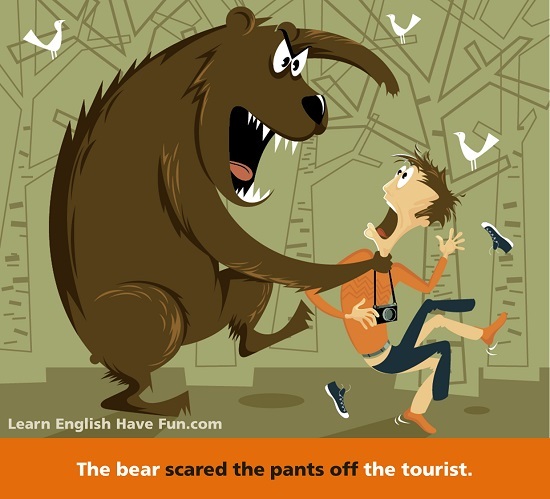 scare the pants off someone (scare someone’s pants off): to frighten someone. My little brother likes to jump out from behind things and scare the pants off everyone. I scared the pants off my dad when I tried to sneak in the house in the middle of the night. scare someone to death: to really frighten someone. That movie scared me to death! When I told my wife something happened at work I scared her to death and she thought I’d lost my job. scared stiff: to be extremely frightened. I was scared stiff through the entire flight because there was so much turbulence. My daughter was scared stiff when she got arrested for shoplifting. burst onto the scene: to suddenly become famous. When Justin Bieber burst on the scene I never thought he’d stay popular for such a long time. I’m so old I remember when Elvis burst onto the scene. cause / make a scene: to be very loud in public in a way that disturbs other people. My two-year-old has been making a scene every time we go out so we usually stay home these days. Please don’t cause a scene at the wedding reception this time — it’s so embarrassing. Can you please call the manager before that customer causes a scene? on the scene: at a place where something is happening. Luckily, the fire department was on the scene within 10 minutes so there was minimal damage to our house. I’m not sure what's happening but I think there are a few celebrities on the scene because everyone's screaming and taking photos. set the scene (for something): 1) to make something more likely to happen; 2) to describe the background about a situation. The defeat of all the top seeds in the semifinals has set the scene for an unlikely winner. The first chapter set the scene for a suspenseful crime novel. My date hoped the candles and flowers on the table would set the scene for a romantic dinner. behind the scenes: quietly and discreetly so that other people don’t notice. The president's security team is always behind the scenes ensuring his safety. There’s a lot that goes on behind the scenes to put on an event like this. As you use the computer, your antivirus system is working behind the scenes to prevent attacks. ahead of schedule: happening in advance of a deadline, before something was supposed to happen. My editor and the publisher were really surprised that I finished the book ahead of schedule. Everyone will get a bonus if the project is completed ahead of schedule. My flight left 15 minutes late but we actually arrived 10 minutes ahead of schedule. behind schedule: happening after a deadline, later than when something is supposed to happen. Unfortunately, the painters did not get their work done so the entire renovation is behind schedule. We’re running about 20 minutes behind schedule so please have a seat and the doctor will be with you as soon as possible. on schedule: happening on time, at the time something was scheduled to happen. I love this bus line because it’s always on schedule. It’s embarrassing — I don’t think any of our conferences have ever been on schedule. in the (grand / overall / larger) scheme of things: looking at the situation in a broader or more general way. Although you didn’t get the grade you wanted in physics, in the grand scheme of things you had a great semester. In the overall scheme of things, staying for one weekend with your grandma is not going to ruin your summer holiday. We got the leather seats because its a small price to pay in the larger scheme of things when you keep a car for 8-10 years. have something down to a science: to be able to complete a process easily and effortlessly. My assistant has the production of our monthly newsletter down to a science and can complete it in just two days. My husband finally has the morning routine down to a science and can get the kids up and off to school without my help. settle a/the score: to retaliate or do something to someone because they did something to hurt you in the past. We’ve got to settle a score with our rivals at the next game. If you try to settle the score with your brother he’ll just fight back and your feud will never end. score points: doing something to make people like or support you. Do you really think you’re scoring points by laughing so loudly at the boss’ jokes? score something: 1) to win something in a competitive activity; 2) to obtain something; 3) to buy drugs illegally. Did you know that in 1962, NBA basketball player Wilt Chamberlain scored 100 points in a single game?! I've reserved a room in a hotel but I really hope to score an apartment within the first month after I move to San Francisco. My boyfriend used to drive all the way to the bad part of the city to score coke and marijuana but he got arrested a month ago and now his parents won't let him drive at all. scrape by: 1) to only have enough money or resources to survive; 2) to almost fail at something. When I was a student I scraped by working part-time in the cafeteria. It’s a terrible score but at least I scraped by with a 70% on my calculus test. scrape together something (scrape something together): to manage to gather or collect something. We’re out of food but I was able to scrape something together for dinner tonight. We scraped some used furniture together to help a young new couple at our church. from scratch: from nothing, using basic materials. My mother makes the best cakes and cookies from scratch. My great-grandfather built this house from scratch in the 1920s. up to scratch: at an accepted standard or quality. My teacher said my paper wasn’t up to scratch but gave me a chance to rewrite it over the weekend. I really loved our receptionist but her attendance was never up to scratch and we needed someone more reliable. scratch one’s head: to be puzzled about or have difficulty understanding something. My dad scratched his head as our dog ran in circles around the house for 20 minutes. I was scratching my head when my girlfriend got angry at me for giving her a necklace. scratch the surface: to handle or complete just a small part of something. I’ve been reading this novel all day and I still haven’t scratched the surface. I started cleaning the house two days ago but I haven’t scratched the surface and our guests are arriving tomorrow. sell someone / something short: to estimate or value something as smaller or less important than it really is. You're selling yourself short by saying you're a beginner when you've studied three years of English. My boss sold the temporary administrative assistant short — she actually is going to law school in the evenings and was really helpful at the meeting yesterday. wolf in sheep's clothing: Someone or something that pretends to be good or friendly but is actually trying to cause damage, harm or take advantage of you. I always thought strangers were wolves in sheep's clothing but sadly I learned family members can also be trouble makers. Students at my university are so competitive that I learned the hard way that many of my "friends" were actually wolves in sheep's clothing. shy away: to avoid something; to keep oneself from doing something. Normally, I shy away from speaking in public but I really enjoy the Toastmaster's speaking club because the people are so nice and understanding. I promised myself that I wouldn't shy away anymore from wearing bold colors and prints. 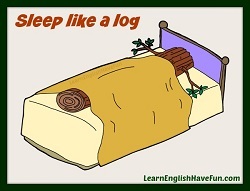 sleep like a log: to sleep very soundly (deeply) — so well that noises don't even wake you up. Our neighbors had a party last night and the police were called but I slept like a log and didn't hear a thing. I drank so much at the party that I came home and slept like a log for 12 hours. 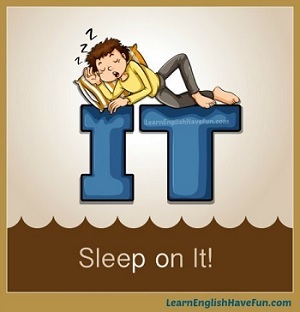 sleep on something: to wait until the next day (in order to think carefully) before making an important decision. There's no need for you to sleep on it. We know it's hard to make a decision so we created a free 30-day trial where you can cancel your membership and get a full refund if you don't like it. My boyfriend proposed to me in front of all of our friends so he wasn't very happy when I said I wanted to sleep on it. at a snail's pace: very slowly. I'm so frustrated because, although I started exercising every day, I'm still losing weight at a snail's pace. My youngest son does his homework at a snail's pace but as long as we are patient while helping him, he does eventually complete it. 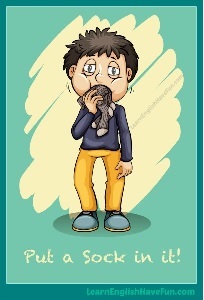 put a sock in it: a rude (impolite) way of telling someone to stop talking or be quiet (stop making a lot of noise). Hey! Put a sock in it or you'll have to leave the movie theater. My roommate was talking to her boyfriend for almost 3 hours last night and I finally asked her to put a sock in it. Have you signed-up for my free newsletter? I include an audio magazine article every month that's choc full of new vocabulary and idioms. You can also find many idiom definitions with the different online learner's dictionaries. It's your turn to practice. This is the part everyone likes to skip but it's the most important part! I know I said you don't need to use them in your own speech and that's true. However, you can practice using them here in order to make sure that you understand the meaning and because practicing helps you remember new phrases. So simply choose a couple of idioms from the list and create your own sentences in the comments box below.